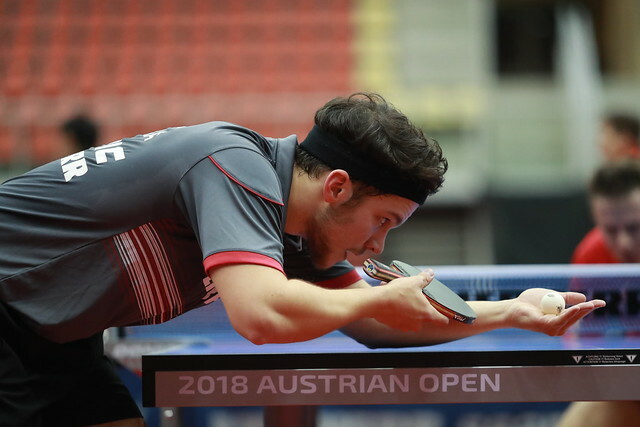 China versus Japan, such was the scenario on the morning of Saturday 10th November at the quarter-final stage of the Men’s Singles event at the Seamaster 2018 ITTF World Tour Platinum Liebherr Austrian Open in Linz; the decision in both contests went in favour of the former. Fan Zhendong, the top seed, accounted for Koki Niwa, the no.10 seed (11-8, 11-6, 8-11, 11-5, 11-9); Xu Xin, the no.2 seed, ended the hopes of Tomokazu Harimoto, the no.8 seed (6-11, 17-15, 11-9, 11-5, 10-12, 11-9). In a rich vein of form, following recent successes at the Liebherr 2018 Men’s World Cup and some six days ago in Sweden, the consistency exuded by Fan Zhendong proved the telling factor against the high level of skill displayed by Koki Niwa; success in the close opening game, undoubtedly added an extra degree of confidence. A five games success for Fan Zhendong, for Xu Xin it was one game more and some nervous moments; time and again Xu Xin recovers from losing the opening game, against Tomokazu Harimoto he did the same but very nearly he went two games to nil in arrears. The second proved crucial, Tomokazu Harimoto held game point on five occasions before on only his second opportunity, Xu Xin converted, Tomokazu Harimoto having elected for “Time Out” when ahead 13-12. Xu Xin duly captured the next two games before in the fifth; Tomokazu Harimoto established a 10-8 lead. Both game points were saved but at 11-10, Xu Xin could not repeat the feat. Stung by the reverse, Xu Xin sped into a 7-1 and 9-3 lead in the sixth game, determined Tomokazu Harimoto won the next four points; at 10-8, Xu Xin held two match points, on his second attempt, returning service, the faintest of edges, Xu Xin prevailed. Success for Fan Zhendong and Xu Xin; both retained their perfect records. Now ten encounters against Koki Niwa, including earlier this year at the Asian Cup in Yokohama and on the Seamaster 2018 ITTF World Tour in China, Fan Zhendong has won all ten. Similarly, it is four out of four for Xu Xin, notably earlier this year he beat Tomokazu Harimoto at the Seamaster 2018 ITTF World Tour Australian Open. Now at the semi-final stage, the matches to be played later today, Fan Zhendong meets colleague Liang Jingkun; Xu Xin opposes England’s Liam Pitchford. A win for Liam Pitchford and he will secure a place in the Grand Finals to be staged next month in December; defeat and the place goes to Germany’s Timo Boll.